This area had been neglected since last year when we removed lava rock that had been a landscape accent for a long time. We finally got it completely removed and finished with the mulch. This large stone was left over from last years Japanese Garden project so I had Dan set it over here. A new layer of mulch freshens things up nicely. 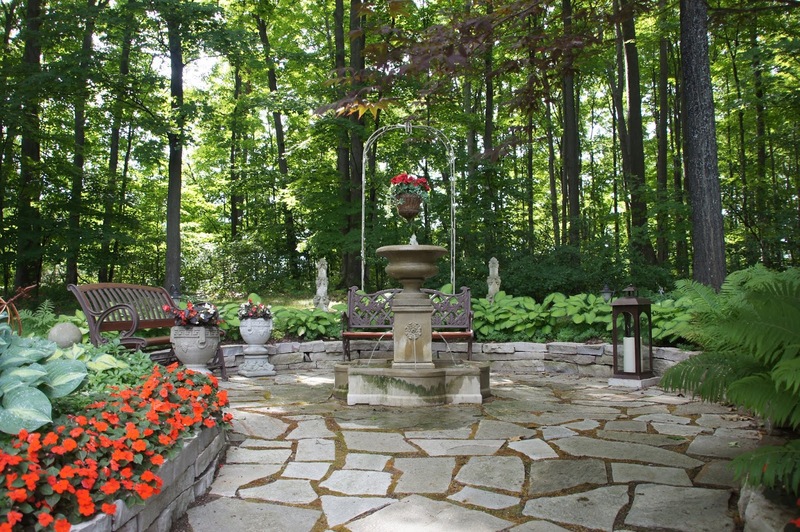 We re-did this area last year- you can see that project "here" if you'd like. It really was a great improvement from what it had been. I still have to shape these shrubs up. This was several weeks ago when they were blooming. Out back by the patio I did a little makeover project. I dug out a bunch of these hostas and some were transplanted out front to the area I just showed above by the big stone. I grouped them together so they appear like one extra large hosta. Now I want the stone moved a tad- lol...it never ends! The creeping Jenny got lifted and set aside split up and replanted. I planted a new to me Hosta called Brother Stefan. When these are mature they'll cover a much larger area and definitely be touching. It will be almost hedge-like. Things got real messy! The thick heavily textured leaves also resist slug damage and I like there coloring. I found this fairy statue at Home Goods a little while ago and finally gave her a home here. I moved out the wood/metal garden bench that was here and had Dan put the cement one back that used to be here. It is easier to see the plants this way. I relocated the planters with the orange begonias over here too. That's enough tweaking outdoors- time to kick back and enjoy! Yes, the work never ends and one thing calls for another! I can see all you have done and relate to the tasks. My wooden benches are high maintenance as well as my metal one. The concrete ones are much easier. Your grass is so thick and healthy looking. 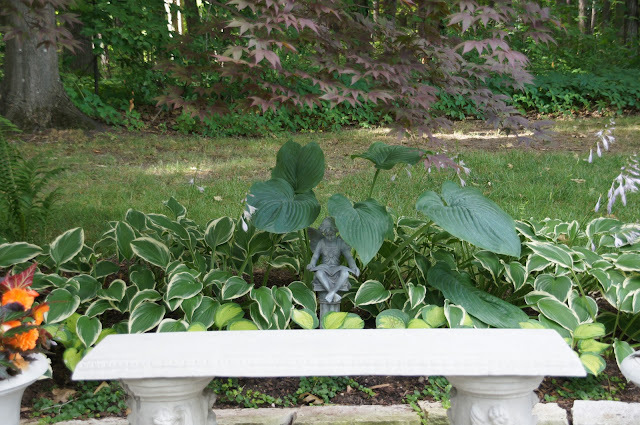 Thanks again for all your tips on growing hostas. Yep the yard work never ends. But we love it right?!!!! Your hostas are doing great. Mine have been doing pretty good but now are showing some signs of something eating at them. I sprayed them so I hope that will help. Mine are sprouting the purple flowers already. Have a great day. 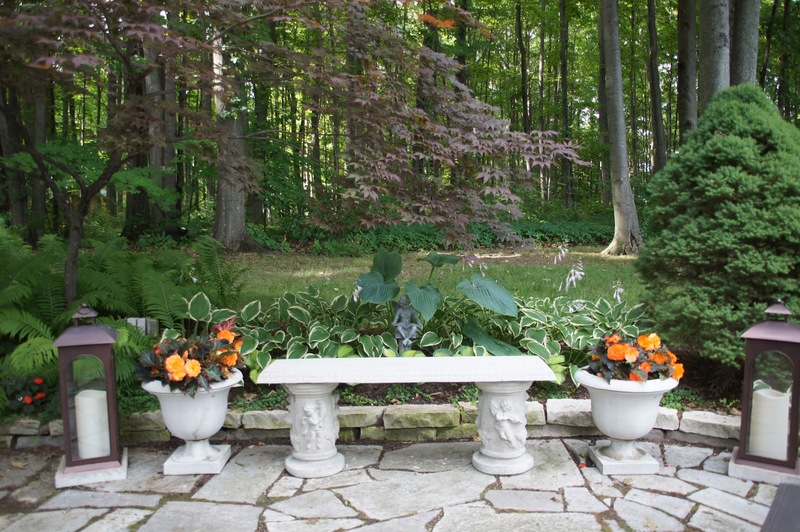 Your gardens are always so beautiful and it shows that you put a lot of hard work into it....I love hostas, but the deer love hostas too...in the next house we plan to have a fence, so maybe it will keep the deer away! I need to divide my hostas here to take some to the lake and just haven't yet. Yours look great! Love your hostas! We don't have a lot of shade, so I don't have any. Everything looks so lush and beautiful. The yard work is keeping you pretty busy, but the rewards are endless. Love your new fairy. now, go and relax a bit. A little updating indeed! I'd call it a transformation, but whichever term you use the results are beautiful. 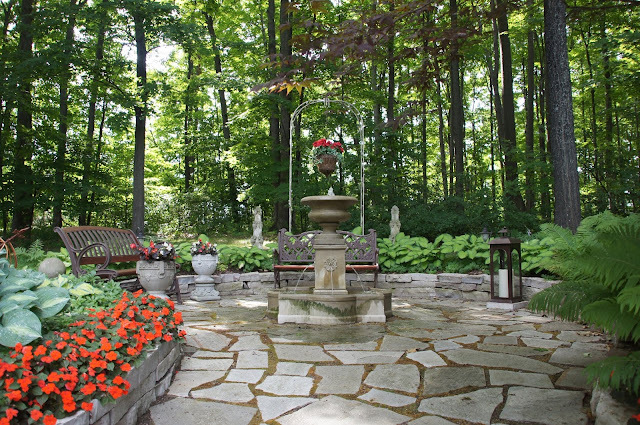 I like your repeated use of symmetry - it defines your gardens and contrasts with the natural trees in the background.